Clear Turn makes it easy to give your skin anti-aging spa treatments at home. Biodegradable paper facial mask infused with the natural sunscreen Astaxanthin protects while moisturizes skin in just 5 minutes. Weakly acidic, no fragrance, no colorant, and no alcohol. Astaxanthin, a substance known to be the most potent known antioxidant, has a natural and scientifically proven anti-inflammatory ability. In addition, Astaxanthin has been indicated as a naturally occurring skin protector that can minimize the damage caused by the sun's rays. Astaxanthin is a member of the carotenoid family, a group of plant chemicals used by many species of flora to ward off damaging effects of the sun. A natural sunscreen, astaxanthin has been protecting plants for thousands of years. Each moist sheet has cutouts for eyes, nose and mouth. The soft mask conforms to the shape of your face, hugging the key areas around the eyes, nose and mouth. 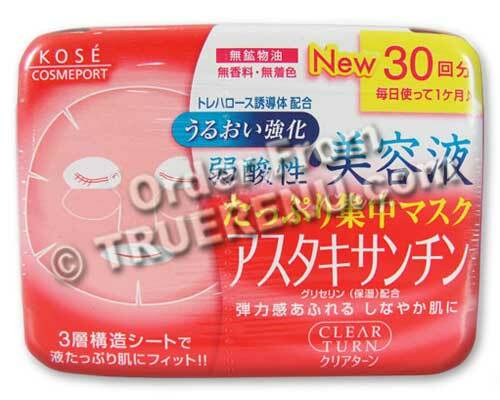 Ingredients: Water, glycerin, BG (butylene glycol), astaxanthin, glycosyl trehalose, haematococcus pluvialis (astaxanthin-rich algae) extract, laminaria japonica (modifilan brown seaweed) extract, disodium EDTA, PEG-50, hydrogenated castor oil isostearate, caprylic/capric trigliceride, triethylhexanoin, disodium phosphate, sodium phosphate, hydrogenated starch hydrolysate, phenoxyethanol, methylparaben.